Myrtle Beach Snowbird: Snowbird Pet Lovers Check This Out!! Snowbird Pet Lovers Check This Out!! I wanted to share this pet safety tip that I came across while reading Martha Stewart! What a great idea for your pet to wear during your winter retreat in Myrtle Beach! 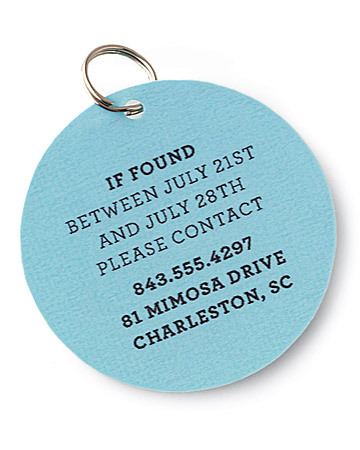 If you take your pet on vacation this summer, add a tag like this one to her collar. That way, if she strays, people will be able to reach you. Print your contact information on card stock. 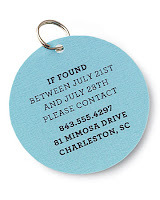 Using a 2-inch circular craft punch or scissors, cut out card stock and 2 pieces of clear self-adhesive shelf liner. Sandwich paper between pieces of liner. Punch a hole for a key ring to attach to a collar. My Recommended Pet Vet for Snowbirds!